Can You Tell Who The Celebrity Is Behind This Sh*t Disguise? 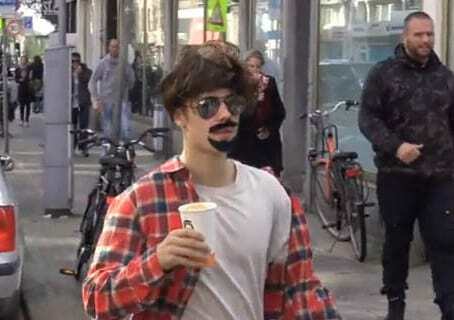 In a truly bizarre move, Justin Bieber has gone out for a coffee in Amsterdam in what could be the worst disguise ever seen. Looking like some sort of deformed Ron Jeremy, Bieber attempted to go ‘undercover’ rocking a moustache, goatee beard and wig that he has to have bought at a joke shop, reports the Daily Mail. Possibly wanting to enjoy a coffee incognito, Bieber only really succeeded in drawing even more attention to himself than normal thanks to his outrageous get up. Having his distinctive neck tattoos – which include a large pair of angel wings – on show didn’t really help with his ploy and in a particularly poor attempt to go under the radar, he even approached some girls asking ‘does this look real?’ No mate, no it doesn’t. It obviously didn’t take long for people to realise who he was – considering the shitness of his disguise – and having bought his coffee, people began trying to take pictures of the 22-year-old. Biebs has got a few more dates to play in Holland before heading over to the UK for the next leg of his tour which includes four nights at the O2 Arena.